Suzuki or seabass is a fish so popular with anglers all over the world that a lot of people forget it is an extremely popular for sashimi and sushi in Japan. Like any other fish, it bears many names: Madaka, Hakura, Shiibasu. In the Kanto area, including Shizuoka Prefecture, it is called Seigo when under 25cm. 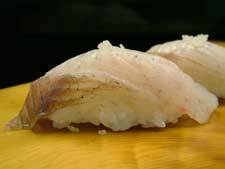 At 3 years of age, when it has attained a length near 60cm, it is called Fukko or Suzuki. 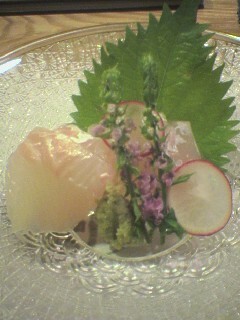 In Kansai it is called Seigo, Hane, and Suzuki. 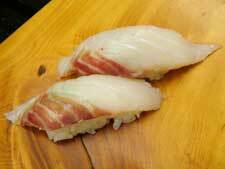 A summer fish par excellence, it is caught mainly in Central and western japan. The bigger and the older the fish, the better it is considered. After a decline in the 1980’s, catches have increased recently, reaching more than 9,300 tonnes after 2000. Of course it is a fish you can appreciated cooked or simmered, or grilled,although it becomes fragile upon being cooked.